Freshly picked sweet corn has exceptional flavour compared to shop-bought fresh corn and is immensely better than frozen products. Originally from Central America, sweet corn shares with other crops of tropical origin the ability to grow much faster than crops native to temperate climate. But it must have reasonable levels of summer warmth to achieve such growth. Despite using varieties specially bred for cooler climate, in a cool Irish summer, it may not grow well. In fact, it is an excellent indicator of a poor summer. 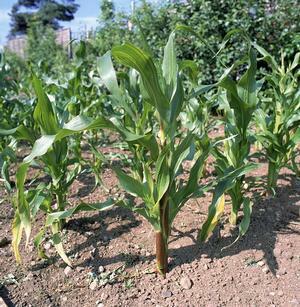 Good crops of sweet corn mean a nice sunny summer, while a poor crop, or no crop, means a cool, wet and dull summer. In terms of site, it is important to maximise temperature and sunshine by choosing a sunny, warm, sheltered spot. The soil must be deep, open, well-fertilised and well-supplied with rotted organic material - all the needs of a potentially fast-growing plant. With a lot of interest in sweet corn, the breeders have been actively trying to breed varieties suitable for more northern latitudes and new varieties are emerging each year. These are also classed as supersweet varieties, sugar enhanced varieties and normal varieties. The supersweet kinds have much higher sugar levels and taste relatively sweet compared to normal kinds, but some people find them too sweet. The sugar-enhanced varieties have been bred to last longer before becoming starchy which can occur quite quickly in warm weather in late summer or early autumn. A variety of normal sweetness, ‘Sundance' is one of the best varieties, early to mature and probably the most reliable. It is certainly a good choice in cooler parts. ‘Swift', also called ‘Tendersweet' is an early maturing supersweet variety. ‘Champ' is another early supersweet variety, reliable in cool conditions. ‘Miracle' is a relatively new variety, sugar-enhanced, with large cobs. ‘Ovation' is a mid-season supersweet with long cobs and a reliable variety. ‘Dynasty' and ‘Conqueror' are two late-maturing supersweet varieties that can cope with less-than-ideal conditions. The variety ‘Indian Summer' has mixed coloured seeds. In the cooler areas, it is best to stick to the early-maturing varieties, spacing a sowing two weeks after the first to achieve a spread of supply. In parts of the country with a longer growing season, especially in the south and near the coast, an early, mid-season and a later variety can be sown to achieve a spread of supply over a period of about three weeks. Each variety does not stand for much more than a week or ten days before becoming starchy and hard. Warm areas inland that have a shorter growing season can compensate to some degree by having higher summer temperatures and good result scan be got from the quicker-maturing kinds. Typically, the middle of April is a good time to sow. A week or so earlier in the warmer parts and a week later in the cooler areas. Four to six weeks is enough for the seed to sprout and the young plants to reach about ten to fifteen centimetres for planting out. If they grow much bigger before planting out, they run the risk of stunting and going to flower prematurely and not setting cobs of usable size. Ideally, each seed should be sown in a small pot, even up to a one-litre pot. If the weather is really cold towards the end of May or early June, plants in a large pot will have a reduced chance of stunting and can be held for a week or more. If small plants are put out in cold conditions, they often get a severe setback and behave as though pot-stunted. Sowing directly into the open ground is successful in a good year with an early-maturing variety but it is hardly worth the risk. Covering the soil with polythene or a low tunnel can help by increasing the soil temperature. But sowing indoors, even on a kitchen window sill gains the plant a month's time that they are unlikely to overhaul when direct-sown. Plant out in the right weather conditions as much as possible, though your hand may be forced by the weather. Plant into soft soil and do not firm much. Water immediately if the weather is dry. Plant in a block of short rows rather than one long row so as to improve pollination. Pollen is shed from the male flowers at the top of each plants and settles on the female tassels that protrude from the top of each cob. Space the plants forty to fifty centimetres apart each way. Control weeds by lightly hoeing regularly. Water if the plant needs it. One or two liquid feeds directly to the root of the plants can often be useful to kick-start them if the weather is poor immediately after they are planted out but wait until there is an improvement in the weather. When flowering starts make sure they do not run short of water. Try at all times, from sowing to harvesting, to maintain steady even growth. When the tassels on the top of each corn cob begin to turn brown and wither, it is time to check a few cobs. Strip back the sheath around the cob. See if the seeds are well-swelled and beginning to square-out in shape. If they are still round and pearly, they are unlikely to be ready. Press a few seeds - if the juice is clear and watery, they are not quite ready, if it is slightly cloudy to milky but liquid, they are ready, and if it is white and toothpasty, they are getting past use. If dry and hard, they have become too starchy. Use them as soon as they become ready, a few plants are always a little ahead and before they get too advanced pick the remainder and freeze them if necessary. Home-frozen corn can be excellent. Strip off most of the sheath but not all to freeze it. Most crops yield only one cob per plant, two is very good and three is excellent and exceptional, happens only in a rare year. There are no pests and diseases of note - the vagaries of the summer weather are much more likely to cause problems. Seeds sown in compost that is too wet and cold, often rot and do seeds directly sown. Mice can take the seeds in a greenhouse or outdoors. Cobs opened for testing but not ready are often invaded by earwigs.